Introducing an acrylic point of sale display product is an affordable and effective way to improve your business displays. Acrylic POS covers a wide spectrum of products, from Perspex leaflet holders to plastic shelf talkers, all of which are vital in certain industries. Acrylic POS display products are great for any business. What are acrylic and perspex made of? Acrylic and Perspex are essentially the same thing - Perspex is a branded version of acrylic. Acrylic is a thermoplastic known as polyacrylate and is derived from a natural gas. It is a composition of MMA and PMMA resin. Perspex is also made up of MMA and PMMA. Why should I choose acrylic? What kind of perspex display products do you manufacture? 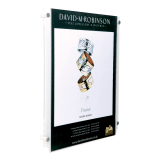 Leaflet holders, showcard holders, poster holders, menu holders, brochure stands, window displays, shoe stands, plate stands, ballot boxes, slat wall shelves and many many more. Styrene is a clear plastic that is often used as a cheaper alternative to acrylic. 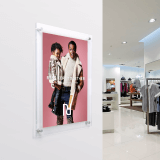 Styrene is a durable and strong plastic that is perfect for displays that are exposed to customer handling. Styrene is used as a budget solution as it is less scratch resistant than acrylic or Perspex and does not offer the same crystal clear clarity. I’d like a colourful acrylic display, is this possible? Acrylic displays can be manufactured in a wide range of colours, so no matter what your display and whether you decide on clear or colour, their will be an acrylic display perfect for you. Our acrylic display stands are crystal clear and finished with a diamond polish, so dependent on the style of product you are looking for, the clear finish may be best for you. The clear acrylic will not distract customers or visitors from your product or literature, which might make them more likely to interact. However, if colour is a part of your business, then perhaps a clear acrylic display will get lost among your other displays or décor. Coloured acrylic still has the highest quality finish and will be on par with it’s clear counterpart. 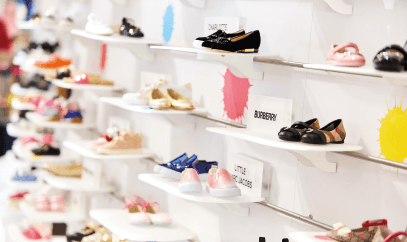 Can plastic display products be used outdoors? 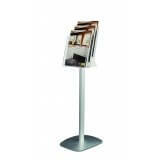 Acrylic or perspex displays can be used safely outside. The plastic will be waterproof and should not discolour or melt in the sunlight. 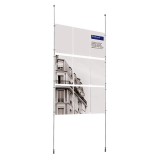 We have a range of acrylic products, such as outdoor leaflet holders, that are specifically designed to be used outdoors. The best way to keep your acrylic or perspex display looking it's best is with a Anti Static Optical Cleaner paired with a Micro Fibre Cleaning Cloth.